Zip those home projects out in no time with well-organized and properly stored tools and other home maintenance equipment. Garden supplies, vehicle implements and liquids and home tools such as hammers, saws, nails and power equipment all benefit from proper care and storage. These items organized efficiently make home projects easy, and make clean up even easier. Unorganized tools and home equipment make household tasks time consuming. 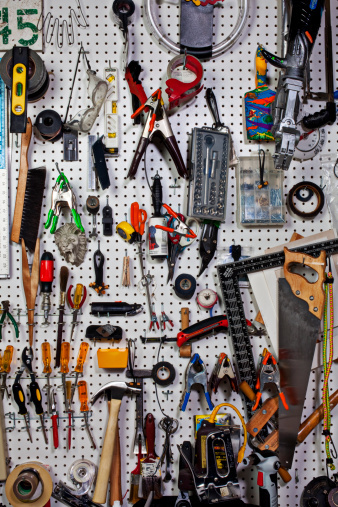 Delegate a portion of your garage, shed or basement closet as a place to store tools. Clean out the junk and clutter and make a space only for tools. Figure out how much space is needed for the amount of tools you have. Sweep away cobwebs, dirt and other foreign matter. Get a shelving unit and store chemicals, liquids and paint substances out of the reach of children and pets. Find the parts. Locate cords, bits, nails and screws and organize them. Allocate plastic bins to store smaller household tools. If you have a large tool collection, organize by type for easy location. Keep the parts for each specific tool close by. Clean out dirt and debris from tools. Oil power tools to lubricate moving parts. Repair loose handles and clean out oil or other fluids used to power the tool. Sharpen blades and replace worn out parts. Set up racks. Mount commercially available racks along the wall of your garage or storage area to hang garden tools, cords and other equipment. Screw racks into the wall with screws recommended by the manufacturer and a power drill. Wind long cords in a loop and hang from rack. Place tools on racks by the handle. Draw the outline of the tool with a permanent marker to identify its place, or use labels to mark the location. Create a library. For tools and appliances that have various functions, designate a library area or bin within the storage space for user manuals and warranty sheets. Store the booklets alphabetically and in a dry area. Type up a sheet listing all of the books to create simple table of contents.